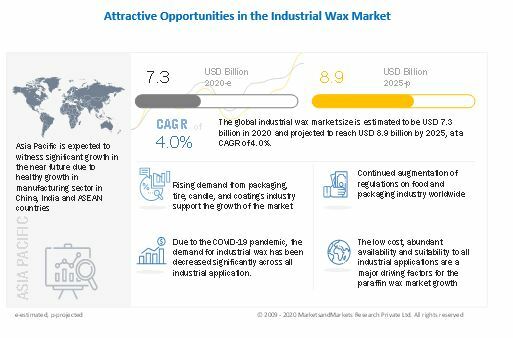 [171 Pages Report] The industrial wax market size is projected to grow from the estimated USD 9.8 billion in 2018 to USD 14.3 billion by 2026, at a compound annual growth rate (CAGR) of 4.8%, during the forecast period. Industrial wax is an organic substance that is used in several applications, such as candles, packaging, coatings & polishing, hot-melt adhesive, tire & rubber, cosmetics & personal care, and food. The growth of the industrial wax market is, therefore, directly associated with the growing demand from these applications. Packaging is the second-largest application of the industrial wax market. Packaging is the second largest-application that uses industrial wax. The industrial waxes have good lubricating and moisture barrier properties, and are hence largely used in food packaging materials. These waxes can protect dried foods from moisture or reduce the moisture loss of the packaged food. In addition, a wax-coating protects foodstuff during transportation and handling. Moreover, a paper coated with wax is a proficient and cost-effective wrapping that protects the products from humidity, water, and greasing. The bio-based waxes segment to be the second-largest type of the industrial wax market. Bio-based waxes are renewable and environmentally-friendly. These waxes are used in several applications, such as cosmetics, pharmaceuticals, polishes, and cheese coatings for protection against mechanical stress, water-loss, UV-radiation, and parasites. Owing to the rising environmental concerns and the low availability and cost of paraffin waxes, the demand for bio-based waxes is expected to grow, globally. Asia Pacific is estimated to account for the largest market share during the forecast period. 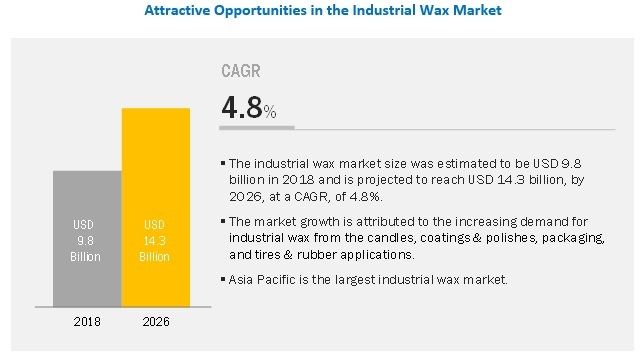 Asia Pacific was estimated to be the largest in the overall industrial wax market in 2018. The region has emerged as the largest consumer of industrial wax, owing to the growth in the production and consumption of candles, packaging products and coatings China, India, Japan, among other countries. China is expected to account for the largest share in the Asia-Pacific till 2026 with India registering the fastest growth rate during the forecast period. Some of the leading players of the industrial wax market are Sinopec (China), Royal Dutch Shell (Netherlands), Petroleo Brasileiro (Brazil), Exxon Mobil (US), Sasol (South Africa), Oil Co. Lukoil PJSC (Russia), Numaligarh Refinery (India), HCl (China), The Blayson Group (UK), and International Group (Canada). Most of these leading players have a wide regional presence and focus on producing waxes from renewable sources to meet the demands of end users. In March 2017, Sasol inaugurated the full completion of its FT Wax Expansion Project (FTWEP). Phase 2 began operation in March 2017. In May 2016, Imperial Logistics group, company Goldfields Logistics, was awarded a three-year contract for warehousing and distribution services of Sasol Wax. In January 2016, Sinopec commenced constructing its R&D Center in Saudi Arabia. The Center is expected to focus on technology research, serve as technology promotion center as well as a senior personnel training center of Sinopec. What are the global trends in demand for industrial wax? Will the market witness an increase or decline in demand in the near future? What is the estimated demand for industrial wax from various applications, such as candles, packaging, coatings & polishing, hot-melt adhesive, tire & rubber, cosmetics & personal care, and food? What were the revenue pockets for the industrial wax market in 2017? What are the different regulations developed for the use of waxes obtained from mineral and renewable sources, globally? Who are the key players in the industrial wax market, globally? The study involves four major activities for estimating the current industrial wax market size. Exhaustive secondary research was done to collect information related to the industrial wax market. The next step was to validate these findings, assumptions, and sizing with industry experts across the value chain through primary research. Both top-down and bottom-up approaches were employed to estimate the overall market size. After that, market breakdown and data triangulation were used to estimate the market sizes of segments and subsegments. In the secondary research process, various secondary sources, such as Hoovers, Bloomberg BusinessWeek, and Dun & Bradstreet have been referred to for identifying and collecting information for this study. These secondary sources included annual reports, press releases & investor presentations of companies; white papers; certified publications; articles by recognized authors; gold standard & silver standard websites; regulatory bodies; trade directories; and databases. The industrial wax market comprises several stakeholders, such as raw material suppliers, technology developers, end-product manufacturers, and regulatory organizations in the supply chain. The demand side of this market is characterized by the development of the petroleum and renewable industries. The supply side is characterized by advancements in technology and diverse application industries. Various primary sources from both the supply and demand sides of the market were interviewed to obtain qualitative and quantitative information. The supply chain of the industry and market size, in terms of value and volume, were determined through primary and secondary research. All percentage splits and breakdowns were determined using secondary sources and verified through primary sources. After arriving at the total market size through the estimation process explained above, the overall market was split into several segments and subsegments. The data triangulation and market breakdown procedures were employed, wherever applicable, to complete the overall market size estimation process and arrive at the exact statistics for all segments and subsegments. The data was triangulated by studying various factors and trends from both the demand and supply sides. In addition, the market size was validated by using both the top-down and bottom-up approaches. It was then verified through primary interviews. Hence, for every data segment, there are three sources—top-down approach, bottom-up approach, and expert interviews. The data was assumed to be correct when the values arrived at from the three sources matched. Sinopec (China), Royal Dutch Shell (Netherlands), Petroleo Brasileiro (Brazil), Exxon Mobil (US), Sasol (South Africa), Oil Co. Lukoil PJSC (Russia), Numaligarh Refinery (India), HCl (China), The Blayson Group (UK), and International Group (Canada) are the 10 key players covered. This research report categorizes the industrial wax market on the basis of type, application, and region.